Juan Sánchez Cotán (June 25 1560 – September 8 1627) was a Spanish painter, a pioneer of realism in Spain. His still lifes, also called bodegones were painted in a strikingly austere style, especially when compared to similar works in Netherlands and Italy. Sánchez Cotán was born in the town of Orgaz, near Toledo. He was a friend and perhaps pupil of Blas de Prado, an artist famous for his still lifes whose mannerist style with touches of realism, the disciple developed further. Cotán began by painting altar pieces and religious works. For approximately twenty years, he pursued a successful career in Toledo as an artist, patronized by the city’s aristocracy, painting religious scenes, portraits and still lifes. These paintings found a receptive audience among the educated intellectuals of Toledo society. Sánchez Cotán executed his notable still lifes around the turn of the seventeenth century, before the end of his secular life. 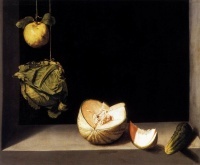 An example is Quince, Cabbage, Melon and Cucumber (1602, in the San Diego Museum of Art). On August 10 1603, Juan Sanchez Cotan, then in his forties, closed up his workshop at Toledo to renounce the world and enter the Carthusian monastery Santa Maria de El Paular. He continued his career painting religious works with singular mysticism. In 1612 he was sent to the Granada Charterhouse, he decided to become a monk, and in the following year he entered the Carthusian monastery at Granada as a laybrother. The reasons for this are not clear, though such action was not unusual in Cotán’s day. Cotán was a prolific religious painter whose work, carried out exclusively for his monastery, reached its peak about 1617 in the cycle of eight great narrative paintings which he painted for the cloister of the Granada Monastery. These depict the foundation of the order of St. Bruno, and the prosecution of the monks in England by the Protestants. Although the painter’s religious works have an archaic air, they also reveal a keen interest in the treatment of light and volumes, and in some respect are comparable with certain works by the Italian Luca Cambiaso whom Cotán knew at the Escorial. While Cotán's religious works are unexceptional, as a still-life painter he ranks with the great names of European painting. In spite of his retreat from the world, Cotan’s influence remained strong. His concern with the relationships among objects and with achieving the illusion of reality through the use of light and shadow was a major influence on the work of later Spanish painters such as Juan van der Hamen, Felipe Ramírez, the brothers Vincenzo and Bartolomeo Carducci and, notably, Francisco de Zurbarán. Sánchez Cotán ended his days universally loved and regarded as a saint. He died in 1627 in Granada. Sánchez Cotán stylistically falls within the school of El Escorial, with Venetian influence, and his works can be placed in the transition from Mannerism to Baroque. He was an early pioneer of Tenebrism at the beginning of the golden age of Spanish painting. Although his religious paintings have a primitive sensitivity and a peaceful rhythm, Cotán's high stature in art history rests exclusively on his still lifes, of which only a few are extant. Their severe naturalism has little in common with the artistic style then prevalent. Sánchez Cotán established the prototype of the Spanish still life, called a bodegón, composed mainly of vegetables. Characteristically, he depicts a few simple fruits or vegetables, some of which hang from a fine string at different levels while others sit on a ledge or window. The forms stand out with an almost geometric clarity against a dark background. This orchestration of still life in direct sunlight against impenetrable darkness is the hallmark of early Spanish still life painting. Each form is scrutinized with such intensity that the pictures take on a mystical quality, and the reality of things is intensified to a degree that no other seventeenth century painter would surpass. Some art historians describe Sánchez Cotan’s spare representations as abstemious images and link his work to his later monastic life. They are supposed to express a monastic denial of worldly pleasure and richness. However, his fruits and vegetables are arranged in beautiful ballet like compositions. The Carthusians are vegetarian, but many of his works contain game bird. Sánchez Cotán never included humans beings in his still life paintings. Nor did he depict many of their artifacts, other than the strings from which vegetables and fruits dangle, this being the common means in the seventeenth century of preventing food and vegetables from rotting. Even if the objects are arranged so that they seem close enough to touch, they are nevertheless distanced. For all the realism with which they are depicted, the isolation of each object, heightened further by the black background, lends them a monumental, almost sculptural gravity. Unless indicated otherwise, the text in this article is either based on Wikipedia article "Juan Sánchez Cotán" or another language Wikipedia page thereof used under the terms of the GNU Free Documentation License; or on original research by Jahsonic and friends. See Art and Popular Culture's copyright notice. This page was last modified 23:32, 7 April 2018.